Fetal hydrops is an abnormal, generalized increase in interstitial fl uid (edema) occurring prenatally and may be observed at any gestation from fi rst trimester to term. There is usually an increase in total body water, and severe degrees of edema are often accompanied by effusions within the body cavities. Indeed, hydrops is usually recognized ultrasonographically by an increase in subcutaneous fl uid in combination with an effusion in at least two serous cavities. 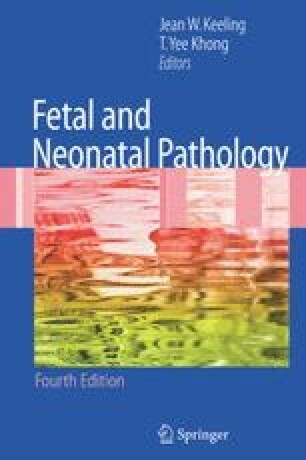 Hydrops should be distinguished from localized postnuchal fl uid blebs (increased nuchal translucency seen by ultrasound), which draw attention to a wide variety of fetal abnormalities that may later be complicated by fetal hydrops (see Chapter 6). The incidence of generalized edema of the fetus is diffi cult to quantify. Minor fetal hydrops is very common, particularly among preterm neonates, and is often unexplained (Cartlidge and Rutter 1986). Major or severe fetal hydrops, defi ned as generalized edema or 5-mm subcutaneous edema in a third-trimester fetus and accompanied by effusions in at least one body cavity, was identi-fi ed in one United Kingdom center in 1 : 1400 pregnancies when cases caused by rhesus incompatibility had been excluded (Iliff et al. 1983).